Either replace your backboard on your existing Lifetime basketball system (contact us for help to determine compatibility with your system before ordering), or set up a new court with the 73621 backboard and rim combo. 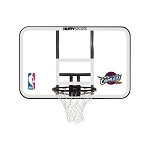 The 73621 features a 48 inch polycarbonate backboard and a spring-loaded, Slam-It rim. The backboard graphics are fade resistant and all steel components are powder coated to help resist rusting. All major components are Made in the U.S.A. The 73621 comes with a 5-year factory warranty from Lifetime Products for customers in the United States and Canada. 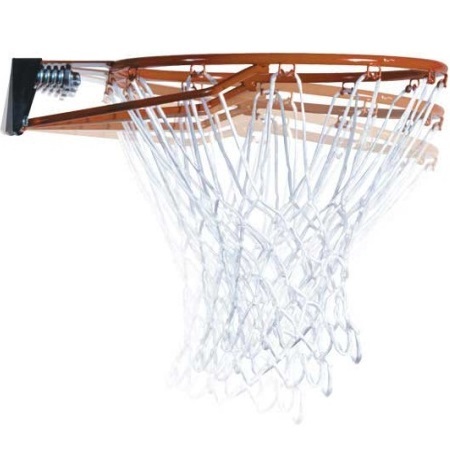 The 73621 is a backboard and rim combo, which includes just a backboard and rim. The mounting bracket and mounting hardware are not included with this package, but are sold separately. 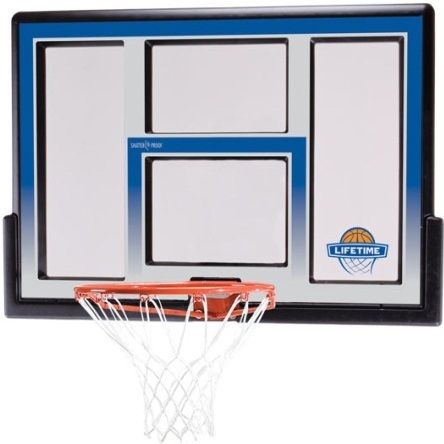 Backboard Pad included made with Polyethylene plastic. 48 inch fusion Lifetime backboards. 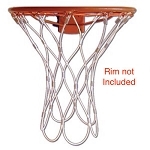 Slam-It rim uses a spring loaded mount to the backboard. Backboard dimensions: 48 inches W x 30 inches H.
Overall backboard weight: about 30 lbs. The backboard got here very quickly. Thank you! Great Service and Quality Product! Thank you very much! A: Unfortunately, if you have a square pole there is no solution for using a lifetime brand backboard and rim. If you have a 4 in.² pole you could always use the Spalding brackets model number 316 and there are two popular backboards that work with those brackets including 79564 and 79307. Q: Is the measurement simply width, L - R? A: Yes, this backboard is 48” Long by 30” Tall by 3 mm thick. Q: It says that the rim color is orange but is shown in blue. Why don't you show the rim in the orange color and is the blue available? I would prefer the blue. A: The rim color is orange. When it is referring to the rim-that means the actual hoop-not the border of the backboard. 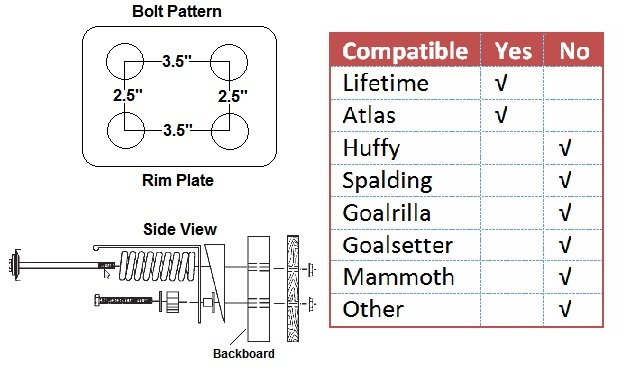 Q: Could I attach a Lifetime Fusion backboard to a Goaliath fixed pole as replacement for a damaged backboard. The Goaliath board was 54", and I appreciate the size reduction. Wondering what kind of attachment is used for the Lifetime system? A: A: Unfortunately the mounting brackets are not compatible across different brands. 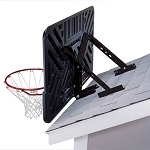 The only mounting brackets that will work with this basketball backboard are the 1044, or the 9595. These will both attach to a 3.5 round pole. 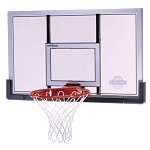 If you want a backboard that will work with your existing bracket, then please call 1-800-467-1421. Q: Will this work as a replacement for my Spalding basketball system? A: No, basketball systems are not compatible across brands. You can view our Spalding 48 replacement backboards though. Q: What mounting hardware do I need in order to mount this to the side of my garage? A: You would need to bracket 9594. You could also use the adjustable bracket 1044. Q: Is there a thicker version of the board? A: there are larger versions of the backboard including 50 inch, 52 inch, and 54 inch sizes, but they are not thicker. These are supported by a frame around the perimeter and down the center to give it rigidity and stability. Q: What does the word "fusion" mean when describing Lifetime backboards? A: If you see the word "fusion" in the name of the backboard design, this refers to the backboard material being mounted inside of a plastic frame. The frame surrounds the backboard and also has two uprights on the back of the backboard. 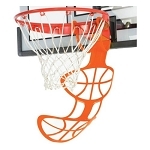 A: If you find the the 73621 Lifetime backboard and rim combo for a cheaper, delivered price than us, let us know. We will beat the price by $10. Please note that the product must be available at the time of purchase - we do not price match out of stock listings. We also do not price match bid auctions, used or defective listings, ship to store pricing, or dealers that our not authorized dealers for Lifetime Products. Q: What is the difference between polycarbonate and acrylic backboards? 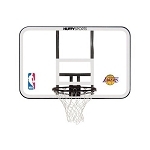 Fast Shipping: Orders for the 73621 Lifetime Backboard and Rim Combo Set generally leave the warehouse the next business day.